Interior Ceilings and Walls, LLC is the New England Regional Distributor for ULTRAWALL, LLC. This area includes the states of Massachusetts, New Hampshire, Maine, Vermont, Connecticutt, Rhode Island, New York and New Jersey. The ULTRAWALL® System is ideal for spaces that require beautiful appearance, quick application and excellent sound and fire performance for most office and school settings. Only four basic components are required to build the ULTRAWALL® System in most projects. As a finished product, less construction is required in creating the wall and office space you need. There are also no intrusive construction details when using this finished product, such as plastering, painting, sanding, and drywall taping. When the project is finished, you're finished. 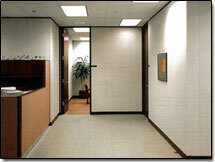 You or your clients are ready to move into clean, finished office space. If yIf you would like to receive literature or have any questions about this remarkable wall system, call us at 1-508-586-3337 or visit the Ultrawall® web site.